EK Water Blocks, Ljubljana based premium water cooling gear manufacturer, is proud to introduce the EK-FCTK20, world’s first water cooling solution for NVIDIA Tesla K20 series professional computing card, the key part of NVIDIA® Maximus Technology. EK Water Blocks now offers complete water cooling solution for both NVIDIA® Quadro K5000 series graphics- as well as NVIDIA® Tesla K20 series computing cards thus completing the offer for this high-end workstation platform. EK Water Blocks’ versatible and fully flexible solution allows for virtually any NVIDIA® Maximus configuration to be used and expanded when necassery. 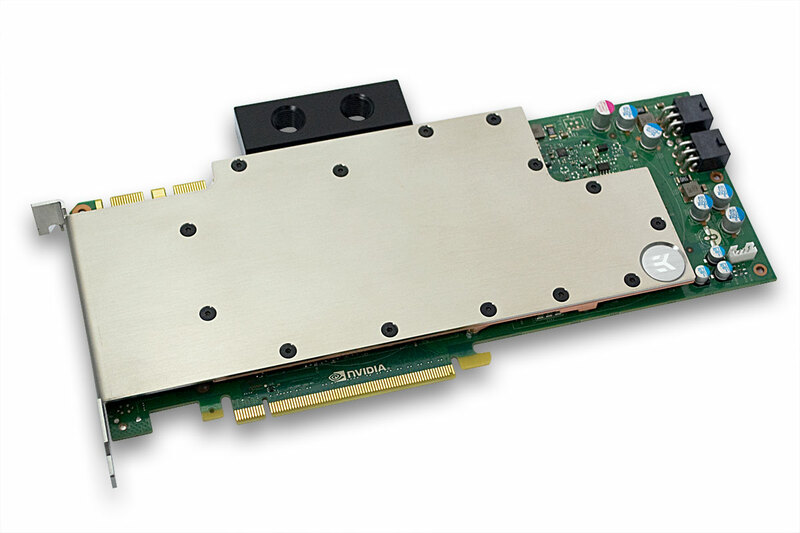 EK-FCTK20 is a high performance full-cover water block for NVIDIA® Tesla K20/K20x series professional computing cards. This water block directly cools the GPU, RAM as well as VRM (voltage regulation module) as water flows directly over these critical areas thus allowing the computing card and it’s VRM to remain 100% stable under any given workload. EK-FCTK20 water block also features a high flow design therefore it can be easily used in liquid cooling systems using weaker water pumps. Base is made of C110 grade electrolytic copper while the top is made of laser cut stainless steel metal plate which also serves as a I/O bracket. The sealing is performed by quality NBR rubber washers. Screw-in brass standoffs are pre-installed and allow for safe, painless installation procedure. Each EK-FCTK20 water block is – just like any EK Water Blocks product – factory pressure tested and comes with 1g packaging of Arctic Cooling MX-2 thermal grease (TIM). EK-FCTK20 comes with the MSRP of 119.95€ (incl. VAT) and will be available for purchase through EK Webshop and Partner Reseller Network on Thursday, March 28th 2013. Pre-orders are already possible.